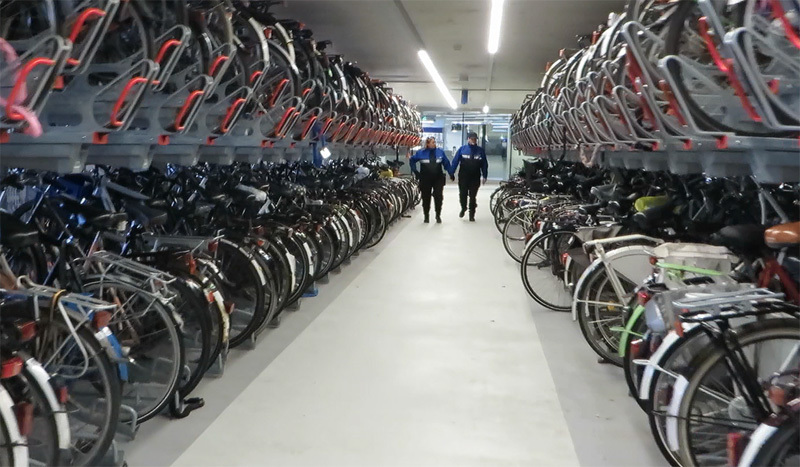 Delft is now one of the Dutch cities with a bicycle parking facility to park 5,000 bicycles at the railway station. The symbiosis of the train and the bicycle is very successful in The Netherlands. The train covers a lot of distance fast and the bicycle makes it easy to reach many destinations in the last kilometre. The dense cycle grid and the perfect bicycle parking possibilities make the train-bicycle combination very competitive with the private car and it is therefore a vital element in the Dutch transportation system. Intercity trains run every 15 minutes in a large part of the country. This will be increased to every 10 minutes in the not so distant future. That is why much of the train-infrastructure is being updated extensively now. Many train stations have been or are being enlarged and renewed and a lot of lines get more tracks. Soon the Dutch train network will feel even more like a nationwide metro system. 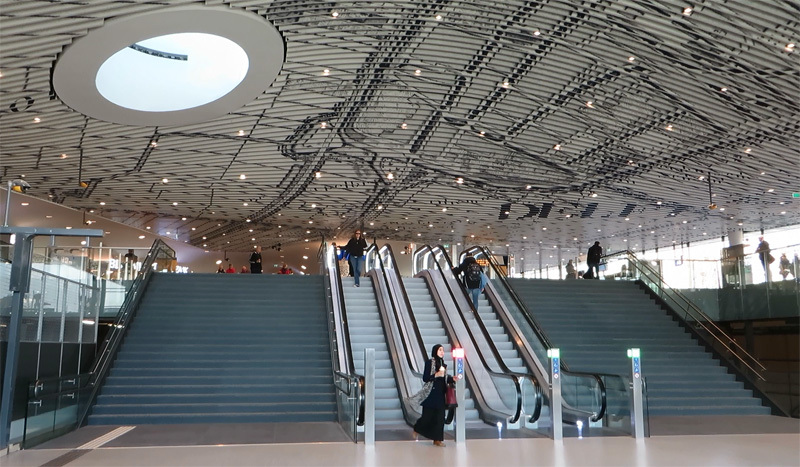 The new station hall in Delft. Delft has changed considerably now that the high line in the city centre has been replaced by a 2.3 kilometre long train tunnel. The high line is already being demolished and that means a lot of the old sight-lines in the city will be restored. Facilities for cycling are completely integrated in the train infrastructure updates and Delft is a fine example. The new bicycle parking facility is situated in a rectangular space directly under the bus station in front of the old and the new station building. The facility can be reached by cycleways on a slope alongside a canal. Even though the space is below ground level the proximity of the canal makes it possible to have one side entirely made of glass to bring in light. Also from the station there is a large window that not only brings in even more light but also offers a natural orientation. It isn’t hard to find your way if you can simply see where you have to go. 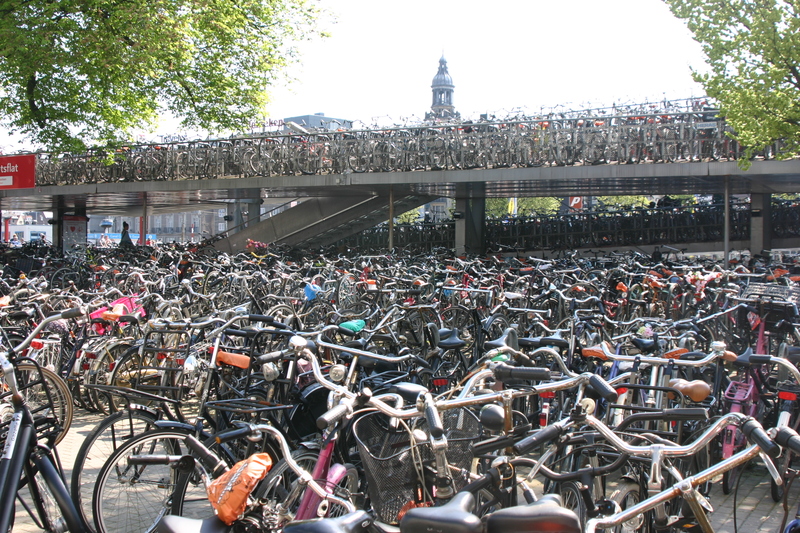 The 5,000 bicycles can be parked in two-tier racks, pretty standard for The Netherlands. Parking your bicycle is free of charge. You are allowed to park it up to 14 days. The facility is very spacious because another entrance that has yet to be built will make it possible to cycle trough the facility from one side of Delft to the other. This will be a public cycleway. That it is so easy to cycle in and out is also one of the disadvantages of this facility. Even though the facility is manned (there is a maintenance service and an OV-Fiets/bike share rental station) the bikes are not really guarded. People often complain when things change, but this time it is serious. The police reported 18 bicycles being stolen in the first month alone, which they call “unacceptable”. It means that almost one bicycle per working day was stolen. So measures were taken. There is more police surveillance (in uniform and even under cover) and the footage from the surveillance cameras is being examined more carefully. Both to see if there are people hanging around there who shouldn’t. To prevent theft there is extra surveillance in the bicycle parking facility. Another valid complaint is from people who up to now paid to park their bicycle in the guarded facility. That has been closed and this means that you cannot choose to pay for a parking spot that you can then use as long as you like (and pay for). Many students in Delft who live elsewhere leave their bicycle in the station in holidays, also for longer periods than 14 days. Which has become the maximum parking period now. This means these people have a genuine problem now, with a bicycle in a different city than where they live, that they would need to park elsewhere. These problems will be taken into account in the evaluation by the city authorities together with the railways and the police at the end of this year. It will then be determined if and what should perhaps be changed. That is why people are urged to lodge their complaints and they do in high numbers. The new station building is magnificent. The hall has a ceiling with a map of Delft from the 1870s and some of the walls and supporting columns have been decked in ceramic tiles in colours that range from the traditional Delft blue to Delft white. The Dutch take pride in their past. A spokesperson from the architects is very proud in the interesting video that explains very well what the thoughts behind some of the features in this station building were. That the measurements of the light fittings correspond with the ceiling parts is not something many people will see right away, but this continuation of measurements, shapes and materials brings tranquillity in a space that can be a hectic transport-hub. Many people are very pleased with how the station became. Delft is a city with many students, also foreign students, and two of these made a very entertaining video on the opening day. Noteworthy is their struggle with the upper-rack. But they get it in the end as well! Facts & Figures The facility was opened on 28 February 2015. There is space for 5,000 bicycles in two-tier racks. The space measures about 5,200 square metres and is situated directly under the bus station and directly over the train tracks and platforms. Every individual rack registers if and how long a bike was parked. That makes it possible to indicate free spaces and also to monitor bicycles that stay over the maximum (and free) parking period of 14 days. There is also an outside parking facility at street level for 3,700 bicycles bringing the total number of parking spaces at Delft central station at 8,700 bicycles. I just love what your designers are doing over there. If ever anything brings me joy is to look at your Train and bicycling infrastructure. All the very best. These large and innovative bicycle parking complexes are magnificent but we are a hundred years away from getting anywhere near this sort of facility here in Australia. Therefore, is it possible to show how a very average bicycle parking system works at an average train station in the Netherlands? I mean with all the minutiae of parking it? i.e. how the bicycles are parked; how, and how quickly, you locate the bike when you return; how many locks and what kinds of locks; how long does it take to park vs. how long it would just take to walk in to the station on foot from the street (an extra 30 seconds, or an extra two minutes, or 5 minutes, or what?). I know this is asking a lot, but if you do such a report then it would help if you could show some bicycle theft and vandalism statistics for bikes parked at train stations (maybe interview the local police for this?) and what happens when a commuter returns to find that their bike has been stolen or vandalised. What do they do? Go straight to the police station and file a report? Or just shrug and buy another one? What is the chance that the police would even be able to find the bike anyway? You see, I believe that the biggest stumbling block to getting people here in Australia cycling every day is secure bicycle parking at train stations. Almost no train traveller even considers doing it. The government have tried to bring in the “Parkiteer” system (please google it) but that costs $50 to register for access to a Parkiteer cage, there is usually a waiting list to get on to one, and even then there are only 26 spots available in each Parkiteer cage (usually only one per station and only 25% of train stations have even got a Parkiteer cage – even the Greens political party think that if they can get the govt to put in an extra 40 cages across the whole city of 4 million people and 207 train stations in four years then that is a good result!!). So the Parkiteer system can never lead to the hundreds of people cycling to the station that we need in order to get even close to the Netherlands. > You see, I believe that the biggest stumbling block to getting people here in Australia cycling every day is secure bicycle parking at train stations. Rather, it’s (still) cheap and abundant oil: When people really start hurting and can no longer ride around carelessly, they’ll start riding a bike to the station, possibly with a folding bike to solve the issues you mention*. Europe has always had to import most of its oil, and the little domestic oil it does have in the North Sea hit its peak around 2000 and is losing 5% a year. Hence high taxes on gasolin and higher use of bicycles (in smart countries like Holland and Denmark, at least). The problem is the interim period, between no bikes and Holland/Denmark. * For theft: As an alternative to theft, just get a good U lock and anti-theft skewers. @alpincesare – I’m sorry but you’ve completely misunderstood the problem. These people are *already* taking the train to work or study. They are *not* driving. Rather they are being dropped off at the station by their parents, wives, brothers/sisters etc. and then going to work or study on the train. The reason they do not cycle the 1, 2 or 3 km to the station is because they are not able to: their bikes will not be there when they return. It might take a week or two for the bikes to be stolen or vandalised, but it will happen. Also, there is no room for even a fold-up bike on peak hour trains in Melbourne. There are people left unable to get on the trains it is so packed, so fold-up bikes would be very unpopular. Even people carrying large bags are frowned upon. What country do you live in, alpincesare? I assure you that in the major cities of Australia the suburban railways are exceedingly popular and that demand is always outstripping supply. Hello FrankR, I’m Dutch myself and will try to answer some of your questions. The bike parking facility in the above video isn’t that different from the average bike parking facility nowadays, as they’re being build everywhere in this country at train stations. I live in a smaller town than Delft(40.000 population compared to Delft’s 100.000), we have a similar underground bike parking facility, just a bit smaller with space for 2500 bikes. It is actually guarded at all times. That said, there still are plenty examples of old outside bike parkings at stations, some examples you can see here: http://bit.ly/1eD9zAX As you can see, it’s often a chaos of bikes, very messy. Which is why all the new bike parkings are being build. For your questions about locks and minutes. Locks depend on the city or environment, in smaller relatively friendly cities you can often get away with just a Dutch wheel lock, in bigger cities a Dutch wheel lock plus an extra chain lock or something similar is needed. As far as minutes go, the bike parking at my train station is about 100 meters from the train station, parking is swift, so is finding the bike. I think about 2 minutes between the time I arrive with my bike and set foot at the station, about the same for the time between leaving the station on foot and riding away on my bike. I think that’s quite average and normal here. Only the crazy chaotic bike parkings like the one at Amsterdam central station(https://vriendsinlowplaces.files.wordpress.com/2012/02/amsterdam-147.jpg) can sometimes take longer. But even that biek parking is just a temporary solution. I think you’re making a mistake though in thinking that bikes aren’t stolen here, or vandalised. Bike theft is a huge problem. Estimates are about 800.000 bikes stolen a year, while only about 100.000 are reported to the police. But all this has never really played a big role in cycling’s popularity, But many Dutch city bikes actually look the way they do because of all this. Strong, simple, often fairly cheap, upright bikes. With backpedal brakes, without gears. They’re build to last and be comfortable. They don’t break easily, and they aren’t standout targets for thieves. That’s the kind of bike you’ll encounter most at train stations here, especially in bigger cities. Honestly though, I don’t think bike parking at train stations plays a big role in cycling’s popularity here, and I’d be surprised if that is the biggest stumbling block there in Australia. Almost every Dutch person cycles on a daily basis during their youth, especially during their teenage years, to and from school. Long before they ever start commuting by train. Most people just continue to cycle as they get older, they don’t start doing it because of a bike parking at a train station. In the end the people cycling to train stations here represent just a small percentage of all cyclists. Hope this was of any help! Thank you Niels for your comprehensive response. I do appreciate the time you took to write it. I did know that bikes were stolen regularly in places like Amsterdam. When I was there most bikes seemed to have three locks on them. I was told that bikes with only two locks on them were just begging to be stolen! I just consider it would be a real deal-breaker here as many people do not consider the possibility of cycling to the station at all, and the prospect of losing a bike will turn them off even more. I really do believe that to get many more people here cycling on a daily basis (currently it’s only a 2% modal share for bikes here in Melbourne: pitiful but it’s still double the amount in the other Australian state capitals!) we need to enable train commuters to ride bikes to the station. Unfortunately distances are very great in Australian cities, the distance to work or study is often too great to cycle all the way for most people – it’s common to live 25 or 30 or 40 km away from work. By getting people to cycle to the station in the morning rather than drive is perhaps the only way to get a significant minority of people cycling every day. At least in the middle and outer suburbs. You’re probably right about the 3 locks. I work in Amsterdam, so I first bike to my local train station every morning to park my bike and take the train to Amsterdam, then in Amsterdam I have another bike at the station which I go to work with. In Amsterdam I have 2 locks, but one of the locks is a massive chain lock that is normally used for motorcycles/scooters. The hills in Australia are actually a problem I think, even related to the bike stealing. I was looking at some articles about bike theft in Australia, and about the Parkiteer system, and one thing I noticed is the difference in bikes. They all look like expensive mountain and racing bikes? Makes sense you would need those ofcourse with the hills, but they’re very vulnerable to vandalism and theft. People don’t park those kind of bikes at the train stations here either because of those reasons. Plenty of expensive bikes are sold here too, but it’s just not the kind of bike people will ride to and park at the train station. I understand your point about people taking their bike to the station, but I still think you’re going to have a hard time changing people’s behaviour unless you start with the youth. I just don’t believe many people will suddenly take on biking at a later age if they haven’t done it regularly previously. 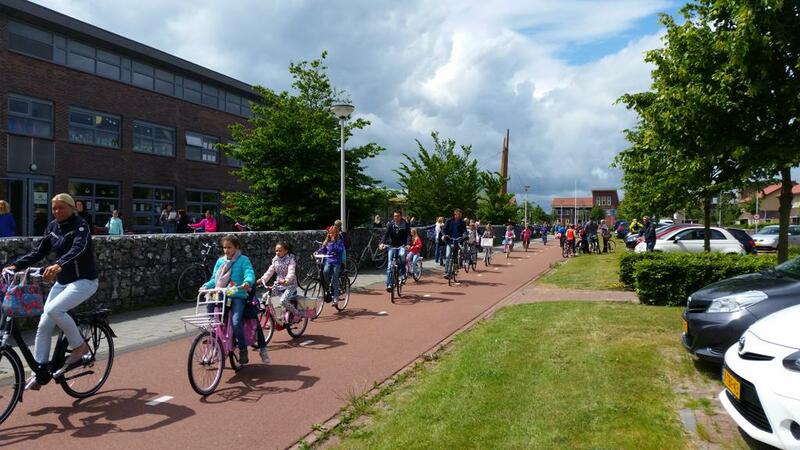 I ran into this picture on twitter earlier: https://pbs.twimg.com/media/CH3NDbPWEAAz83s.jpg A Dutch school run. That’s where Dutch cycle culture starts. Even more for teenagers, almost every kid from the age of 12 to 18 rides their bike everywhere, it’s what gives them freedom and independence. If biking isn’t viable or popular among that age group, then a big cycling culture is just out of the question I think, Because generally a bike is more useful to them than people of any other age. Because they want to have that independence to move around by themselfs, don’t have money to do so, and most of their destinations like friends, school, sports etc. tend to be in biking distance. But as you say traffic is still an issue there, I imagine that’s the root of the problem. A better, safer cycling infrastructure results in more cycling. The idea I get of Australian cycling culture is that it’s just not convenient enough yet. I just watched a video on youtube on cycling through traffic in Melbourne. I’ve been cycling for 30 years but I don’t think I’d be comfortable cycling there either, would feel too vulnerable. And I read that in Melbourne most travelling is done by car, and the average trip is 5 to 10 km, which is perfect cycling distance. So I feel like there’s potential there, just not the right infrastructure. Right now you seem to have a cycling culture that consists of mostly bike enthusiasts and sports cyclists, If you want other people to start cycling it just needs to be safer and more convenient. >> They all look like expensive mountain and racing bikes? I don’t know if they’re usually all that expensive (perhaps $800-1000) but the main type of bike purchased here is a hybrid bike or a road bike. A simple city bike is largely unknown here as they are usually made in Europe and thus attract a high profit margin on the sales on the already high starting price. As such, you don’t often see them. Also, up until about ten years ago they were simply unavailable. At least now, if you go to a special bike shop (and only a few such shops exist in Melbourne – a city with 4 million people! ), you *might* be able to find them. Or someone could start making European-quality city bikes in Asia. That would make them cheap enough for Australians to consider purchasing them. >> I just don’t believe many people will suddenly take on biking at a later age if they haven’t done it regularly previously. Yes, I believe you’re right. I started to cycle to school in the first year of high school as the walk was 25 minutes or more and I saw I could save time by riding. And it was only because my friend’s house was directly across the road from the school gate that I considered riding in. I had a safe and convenient place to park by parking the bike in his parents garage. I didn’t even bother locking it. Unfortunately high schools here have been known in the past to discourage kids from riding in. For safety reasons. Yes, it’s complete madness. Fortunately there is a small movement to counteract this and to get kids to cycle to school. >> If you want other people to start cycling it just needs to be safer and more convenient. Absolutely. You are 100% right. However, it is a bit of a chicken-and-egg problem. You need to have a reason to cycle in order to have a demand for safer on-road cycling conditions, which in turn allows you to think of more reasons to cycle. Secure bicycle parking at train stations will enable adults to cycle to the train station for the first time in our history (at least as far as I know) as they can reasonably expect their bike to be there when they return. And once adults start cycling they may think of allowing their kids to cycle as well. It becomes a thinkable option. Which means that there will be further demand for safe on-road cycling condtions. And so it goes. It’s all inter-linked. Reblogged this on JAGDEEP R.
Thank you! We used to live in the Netherlands, in South Limburg near Maastricht and we miss it so much. Of course we visited Delft many times. It’s so lovely to see the new Train station. You made a very nice video, I really enjoy the whole thing. Pingback: Este vídeo demuestra que en Holanda están a otro nivel aparcando bicis | Galaxy Androids: Todo para tu SmartPhone con Android. LA Metro has five rail projects in process (biggest amount of any U.S. city). There are some bicycle projects included, but nothing remotely approaching what is being built in terms of both quantity and quality in the Netherlands for bicycles at train stations. Ronald Tamse, a traffic engineer from Utrecht, gave a presentation in Portland Oregon in 2011. At 52:50 in this video of it below he gave a interesting answer to a question about what his advise would be in the steps needed to increase the rate of cycling in Portland Oregon over the next ten years. “Advice number one, by far, …stick to your own plan. Interesting pictures of the Netherlands (from his presentation), but, take your time to get there, it needs so much. So stick to your own plan. What I think is wonderful in Portland, I’m a bit jealous of it, the number of residential streets you have. You have a much higher percentage of residential streets than we do. And as you might have noticed, I showed you a cycle route in my city only using residential streets. You have a wonderful, quiet, safe network of streets to start building a perfect network so people can go everywhere. In the past I was asked from people from all kind of countries if I had a bag of a million dollars or a million Euros what would be the best use of this money for cycling, three covered sheltered bicycle parking’s or a bicycle bridge? My answer would be invest in simple solutions like routes along your residential streets. I’ve seen these routes with the sharrows. There’s hardly any opposition against it because you have the space. You don’t have to take out the cars in favor of a bike because this enlarges the chance of an argument. Use this network and try to keep on with extending this network. If it works people will start cycling and then later on go for the more difficult parts. @Robert, most people here have heavy chain locks. You could lock your back wheel to the bike rack, but many people don’t even bother, because they think it’s safe here, or even guarded. Awesome post. Three great videos! One option to mitigate the fact that there is no guard is to have a special position where you use a u-lock or a cable lock to lock the bike to the rack. You could have u-locks for rent in the the same way you get a key with un-maned OV-Fiets stations. 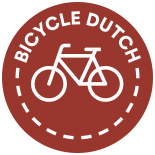 This entry was posted on 2 June 2015 by Bicycle Dutch in Original posts and tagged cycle parking, Delft, railwaystations, underground parking.